Idioms are words or phrases that have a different meaning than the literal meaning of the word or words. There are many examples of food idioms that are commonly used in the English language. They are not only fun to use but are sure to get your point across creatively in conversation. Everyone loves food, and can relate to foodie phrases, but remember that food idioms do not literally mean what they say. For example, if you say someone is a "bad apple" this implies that the person is a negative influence on others or is troublesome in nature. There are endless idioms connected with food. The following are some popular expressions followed by the explanation and example sentence. As busy as popcorn on a skillet - Very active. He was always as busy as popcorn on a skillet and never sat down for a minute. As flat as a pancake - Very flat. The ball was as flat as a pancake after the neighbor's dog bit it. As sour as vinegar - Disagreeable person. Her attitude was as sour as vinegar making it difficult for her to keep friends. As sweet as honey - Very sweet person. He loved being with her since she was as sweet as honey and always knew what to say. Have a sweet tooth - Love for sugary and sweet foods. He had a sweet tooth and never passed up dessert. Like taking candy from a baby - Easy to do. Passing the exam was like taking candy from a baby. Salt of the Earth - Ordinary and decent people. My neighbor is a salt of the Earth type and always helps out when she can. Sell like hotcakes - Sell quickly and in large amounts. Her book sold like hotcakes on the first day it was released. Sugarcoat - Gloss over bad information. Please don't sugarcoat it. I need to know the news right now. Take with a grain of salt - Don't take something seriously. I would take what he says with a grain of salt and not let him upset you. That's the way the cookie crumbles - That is the way that things happen. We can't control where she goes to college. That's just the way the cookie crumbles we have to accept it. Worth your salt - Worth one's pay. His teacher was worth her salt and always stayed late to help her students. Variety is the spice of life - Differences give life interest. Traveling to different cities is fun and exciting. After all, variety is the spice of life. Apple of his eye - A favorite person of someone. She was the apple of her father's eye and he always went out of his way to get her what she wanted. Bear fruit - Get favorable results from something. In the end, her hard work bore fruit and she was accepted into the college of her dreams. Buy a lemon - Buy something worthless. She bought a lemon and always had problems with the car. Compare apples and oranges - To compare things that are very different. You can't compare a race car with a skateboard, that's like comparing apples to oranges. 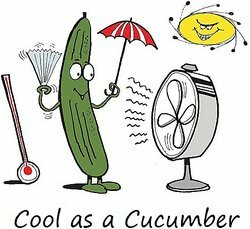 Cool as a cucumber -To remain calm and collected. She was as cool as a cucumber in the interview and impressed everyone. Forbidden fruit - Something banned. She had a crush on her friend's boyfriend but he was forbidden fruit. Go bananas - Excited or crazy. The dog was going bananas when the cat came into the house. In a pickle - In trouble. We were in a pickle when we got lost last night. Life is a bowl of cherries - Life is good and pleasant. He tried to convince her that life of a bowl of cherries in his new town. Like two peas in a pod - Very similar to another person. My aunt and mom are like two peas in a pod and think exactly alike. Low hanging fruit - Easiest thing to get or do. There is a lot of low hanging fruit to get to that can reduce our debt. Rotten to the core - Very bad or corrupt. The board of directors is rotten to the core and needs to be replaced immediately. Top banana - Leader or boss. She was the top banana in her class and everyone looked up to her. As easy as pie - Something that is very simple. The math test was easy as pie and the whole class got a passing grade. Finger in the pie - To be involved in everything. She had her finger in the pie for every event at the school. Have one's cake and eat it too - Having something both ways. She broke up with him, then wanted him to take her to the dance, but she can't have her cake and eat it too. Piece of cake - Easy to do. They said passing the final exam would be hard, but it was a piece of cake. Pie in the sky - An empty promise or dream. She wants to be a famous singer but that dream is just a pie in the sky if you ask me. Half-baked - Not thought through. His business plan is half-baked and it will end in disaster. As nutty as a fruitcake - Crazy person. Her ex-husband said she was as nutty as a fruitcake when she sold all his clothes at the garage sale. Hard nut to crack - Difficult person or thing to understand. She couldn't tell if he was annoyed since he was such as hard nut to crack. Everything from soup to nuts - A wide variety of items. She carried everything from soup to nuts in her huge handbag. For peanuts - Inexpensive, cheap. The last items at the garage sale were being sold for peanuts. In a nutshell - In summary. In a nutshell, I was too busy to worry about other people's problems. Bite off more than you can chew - Try to do more than you can handle. My mom told me not to bite off more than I can chew when I was looking for a third job. Bite the hand that feeds you - To hurt or offend someone who helps you. You may disagree with your parents, but don't bite the hand that feeds you; you'd be lost without them. Bitter pill to swallow - Something unpleasant that you must accept. Losing to the rival team was a bitter pill for the team to swallow. Eat crow - Admit a mistake or defeat. I will have to eat crow tomorrow at work since my project failed. Eat dirt - To retract a hurtful statement. The lawyer had to eat dirt for the rude statement that he made about the client. Eat high on the hog - To live very well and prosper. They have been eating high on the hog ever since he got the big promotion. Eat humble pie - To make a humble apology. The teacher had to eat humble pie when she was the one who made errors in the final grades. Eat like a bird - Eat a small amount of food. My mother complains that I eat like a bird and never gain weight. Eat like a horse - Eat a lot of food. If he keeps eating like a horse, he will weigh 400 pounds. Eat your heart out - To want something you can't have, to be envious. I got tickets for that concert you wanted to go to. Eat your heart out! Food for thought - Something to think about. Your unique suggestion was definitely food for thought and will be considered. Have a lot on one's plate - Very busy. His wife had a lot on her plate from work to the kids. Melt in one's mouth - Delicious or tasting good. The cake just melted in my mouth and left me wanting another piece. On a silver platter - Given something they didn't earn. The CEO's daughter was given the internship since she always got everything handed to her on a silver platter. There is no such thing as a free lunch - Can't get something for nothing. Working hard is a must, there's no such thing as a free lunch anymore. Bad egg - Bad or undesirable person. He was a bad egg and always got in trouble for doing naughty things. Egg on - To encourage or dare someone to do something. He would never have gone into the dark cave if his friends didn't egg him on. Have egg on your face - Be embarrassed. When no one laughed at her offensive joke, she had egg on her face and quickly left the room. Walk on eggshells - Be cautious about words and actions. The boss was in a mood and we were walking on eggshells all day. Fat is in the fire - Big problem or trouble ahead. When she discovered his lies, there was fat in the fire. Goose is cooked - Finished or in trouble. When my parents found out that I wrecked the car, I knew my goose was cooked. Gravy train - A way to acquire/earn easy money. At his father's company, all he had to do was sit back and ride the gravy train. Drop like a hot potato - To immediately stop or abandon something. She dropped her nerdy friend like a hot potato when the popular kids asked her to hang out. Bring home the bacon - To earn money. He worked hard every day so he could bring home the bacon and live a good life. Couch potato - Someone who watches a lot of TV and doesn't exercise much. After his breakup, he became a total couch potato. Chew the fat - Chat casually or gossip. They were best friends and always chewed the fat after school. Meat and potatoes - The basics or important parts of something. The clothing part of the store is the meat and potatoes of the whole business. Her secret was just small potatoes compared to what I was about to say. Stick to your ribs - Something filling and nutritious. He wants a meal that will stick to his ribs and keep him satisfied. Fine kettle of fish - A mess or difficult situation. This is a fine kettle of fish. I thought I paid the electric bill but now the power has been turned off. Have bigger fish to fry - Have more important things to do. I can't worry about her problems since I have bigger fish to fry. Packed in like sardines - Crowded. The venue was so crowded, we were all packed in like sardines and couldn't move. As warm as toast - Very cozy and comfortable. She tucked him in for the night in his new blanket and made sure he was as warm as toast. Bread and butter- Something that provides you with an income. The tips at the restaurant were her bread and butter. Butter up - Flatter someone to get something. She buttered up her parents so they would let her go to the party. Greatest thing since sliced bread - Something that is excellent. She thought her new car was the greatest thing since sliced bread. Half a loaf is better than none - Something is better than nothing. She took the low-paying job since half a loaf is better than none. Full of beans - Feel energetic. She is full of beans from the moment she gets up to the time she goes to sleep. Not know beans about - Unfamiliar or ignorant. I admit that I do not know beans about doing taxes. Not worth a hill of beans - Not valuable. His idea was not worth a hill of beans and was quickly rejected. Spill the beans - Tell a secret. She kept asking me to spill the beans but I didn't want anyone to know I was pregnant yet. Not for all the tea in China - Not for any price. I wouldn't sell you my car for all the tea in China. Not my cup of tea - Not to my liking. Wearing bright colors is not my cup of tea. Cry over spilled milk - Worry about something that can't be fixed. I told her not to cry over spilled milk and to just practice for the next test. As you can see, there are a lot of idioms that pertain to food in English-we do love to eat!-and they are a great way to get your point across in a humorous yet direct way. Using a food idiom is quite common in English and can be seen in daily conversation. Check out some more of our interesting idiom examples, or share your favorite food idiom in the comments below. "Examples of Food Idioms." YourDictionary, n.d. Web. 23 April 2019. <https://examples.yourdictionary.com/examples-of-food-idioms.html>. Idioms are words or phrases that have a different meaning than the literal meaning of the word or words. There are many examples of food idioms that are commonly used in the English language. They are not only fun to use but are sure to get your point across creatively in conversation. Everyone loves food, and can relate to foodie phrases, but remember that food idioms do not literally mean what they say. For example, if you say someone is a "bad apple" this implies that the person is a negative influence on others or is troublesome in nature.